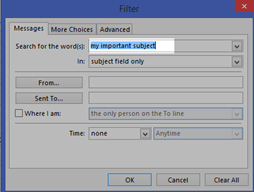 Organizing your Outlook 2013 inbox by color-coding your message helps to bring attention to important messages, or sometimes even reduce the “noise” created by repeated email messages. Let’s run through this process to see how it’s done. Below you can see the green, red, and blue messages that are defined by existing rules. From the inbox, select View from the Ribbon, then View Settings. Click Add, and give your new rule a name. 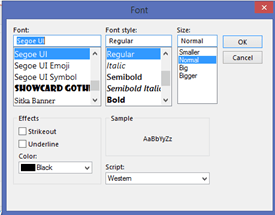 Click Font and select a different color, style, or even size for the selected messages, then click OK. Select condition and enter the search words in the subject or from. 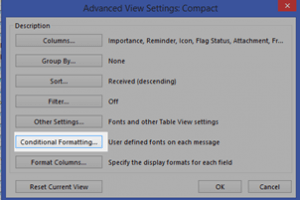 This part of the process assigns your formatting to the search results defined here. That’s it. 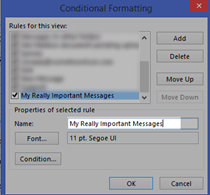 You can define as many rules as you like, and your messages in the inbox will be formatted.